Until I Die is my favorite of the Revenants series. I enjoyed getting to know the characters in depth and seeing them interact with each other. It was also interesting to see Kate and Vincent’s relationship grow and how they learned to deal with Vincent being a revenant. My only problem with this series is how much it reminds me of Twilight. Some of the characters just straight up reminds me of Bella and Edward and the Cullens. I do have to admit that the end killed me. I was so surprised and I just had to know what happens next. Until I Die was a great follow up and it was so much better than Die For Me. It got me super excited about the last book, If I Should Die. 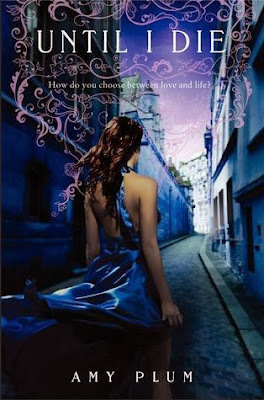 I have to agree with Jenn Until I Die was my favorite book of the series. I love the scenes where Kate was training to learn how to defend herself. After having read the first book I didn’t know what to expect but I was pleasantly surprised. I was on an emotional rollercoaster I didn’t know what was happening and I needed to get to the end. Throughout the book I had this feeling of impending doom, like something really bad was going to happen. (I wasn’t going to like). I couldn’t put the book down and when I reached the end I couldn’t believe what happened. I was devastated, and desperately needed the third book like yesterday. I feel that Amy Plum did a great job with making the characters relatable and keeping me guessing as to what would happen next. I really enjoyed reading Until I Die.